Randy “Euby” Eubanks and Suncoast sponsored American Fine Wine Competition’s “Wine Carnival” benefiting the Boca Raton Children’s Museum! A wonderful affair raising money for a great cause and of course OUTSTANDING American Wines! With more than 50 amazing wines, great food, exciting wine-themed games, fun prizes, and a chance to win tickets to the AFWC Charity Wine Gala on April 8, it was a great event! Also with a rare guest appearance of Mrs. Euby at the Suncoast Table awarding prizes to the spinning wheel winners! And in Suncoast tradition EVERYONE was a winner including Euby who was selected as one of the 8 judges for the Blind Taste Test! Simply sip and determine which wine was what varietal…needless to say Euby had a perfect score! Yes, missed all 8…something to say for consistency!!! Be sure to get your ticket to the next American Fine Wine Competition Event April 8 at the Hyatt Pier 66. There will be great food and 750 wines for the tasting! There will also be about 20 Winemakers pouring even more wine! Get your tickets here! PSDA News! Randy Eubanks was featured in the recent article “Attendees Empowered at CEO Summit” about the 2016 PSDA CEO Summit in Tucson, AZ. According to PSDA in the January 2011 issue of Print Solutions Magazine, there are a few things you should think about when selling document security. Our very own Randy Eubanks, VP of Sales, Owner, is featured in the article giving his advice on document security. Deter fraud with a warning – State security features in a warning band to make criminals move on to an easier target. Layer documents with over and covert features – Including these features that can be seen by the naked eye and features that require a device to be seen will help keep documents safe. Magnetic in character recognition (MICR), watermarks, chemically reactive paper, fluorescent fibers, holograms, prismatic printing and more are some of the best ways to layer your documents. Suggest features that fit the application – Documents all require different grades of protection depending on exposure, so it is best to recommend features that best suit the situation. Offering different choices and levels of security and understanding the application is most important. Consider the environment – Only include verified features. Think about what actually can be used by the customer. For example, do not add photochromic or fluorescent ink to the document if the customer do not have UV lights. Explain due diligence – Explain to customers that the law states that companies can be held liable for check fraud if they don’t show reasonable care in trying to prevent it. Provide clients with a draft letter to their banks, on their company letterhead, informing banks of security features included in the checks (it also provides legal protection). Teach internal safety measures – Inform customers that negotiable documents should be kept in a secure place and boxes should remain sealed. Be careful not to label boxes with “checks” or “gift certificates” or anything that would tempt thieves. Tout your expertise – Make presentations on security documents at American Payroll Association meetings to establish your expertise. Develop community ties – Make allies with the local police and bankers who would also want to reduce document fraud. Join professional or community-based groups, like a chamber of commerce, and offer to give short presentations on document security. Coming of Age – Not only is email marketing the driving force behind content, it is also central to mobile strategies. Emails are the #1 activity on smartphones and now responsive designs are boosting conversation. It also gives companies a great source of data analytics. Gmail Fix – Gmail is predicted to add style support to their mobile apps to give users a better experience. Hyper-targeted Emails – Unique and personalized emails will increase user interaction and ensures a relevant, timely and engaging message. Email Templates – With modular templates, it will be easier to quickly and easily edit designs without having to start from scratch and allowing for improved quality and consistency. It also allows for companies to have versions of the same template instead of each one being different and complex. Personalization – Automated campaigns allow for more potential and increase customer experience. Automation is the most effective way to deliver personalization and relevant experience through email marketing. End of HTML Coded Emails – Email design will become simple in 2016. Powerful drag-and-drop technology will enable marketers around the world to create professional email marketing campaigns that deliver results. Modern emails have edge-to-edge designs, filling up the screen, no matter what size, device, or inbox. Interactive Emails – True user interactivity within email and powerful animations beyond animated GIFs, sometimes called kinetic email, allows marketers to create eye-catching and engaging campaigns that stand out in a recipient’s inbox. Not only will more readers be able to view advanced kinetic content in email, but also the capabilities kinetic offers become more relevant. Animation – Animation and interactivity provide more opportunity for engagement, but can also improve open and click-through rates. Email Campaigns Predict Content – Emails that have been optimized for each individual will be based upon their actions and interactions with websites and emails. Essentially, machine learning allows email marketers to not only deliver 1:1 emails to individuals emails that are personalized to that specific individual, with ease, but also to be continually learning and improving the results. Automation and Email – Marketers will move from sending simple newsletters to segmented and personalized emails campaigns. We’ll see that more marketers will adopt behavior-triggered email and lead nurturing/scoring. 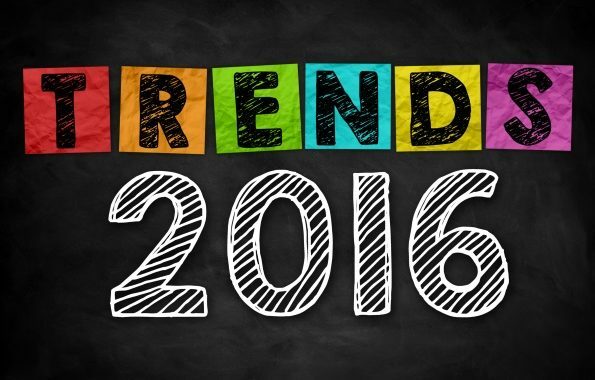 A Closer Look at 2016 Print Industry Trends! On demand – Businesses frequently need printed documents at a moment’s notice and with many not equipped with their own in-house printers, businesses need a print partner that can distribute on demand for all their production needs. Sustainability – In 2016, many businesses want to focus on eliminating waste and reducing their carbon footprint. Print services can accommodate this by using better equipment, good planning, and advanced manufacturing and printing technology. Forward-thinking businesses will be pleased. Personalization – Companies that offer personalized print product will have higher customer satisfaction and will be more prepared to serve customers’ needs as they evolve over time. Personalization increases company loyalty, enhances brand recognition and ties a business’s paper work to them. Multi-channel – Though multi-channel marketing might tend to focus on mobile and social media marketing tactics, print is still viable and a great focus for a multi-channel marketing strategy. Designing and printing high-quality documents has decreased in cost, therefore companies can more easily utilize this for a successful campaign that fits their budget. 2016 will be the year for the print services industry! Possibilities are endless, so take advantage of the industry!